The hair fibre formed in the centre of the hair follicle. The hair follicle located in the scalp ensures the hair fibre's growth. The state of the scalp and hair follicle theerfore has an impact on the hair fibre's development and appearance. 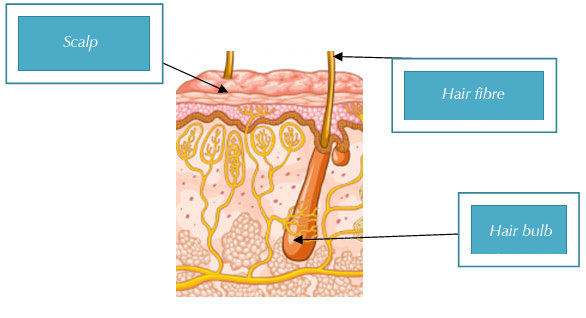 The root or hair follicle is located under the epidermis and in the dermis. That is where the hair forms and colours. The hair fibre is essentially made up of keratin, a true concentrate of amino acids. It also contains water, lipids, and trace elements. These elements can be carried to the base of the hair follicle by the blood flow but can also be trapped by the hair from its environment. The cuticle : the outermost layer of the hair fibre, made up of colourless scales. These scales are held together by intercellular cement rich in lipids that make the hair waterproof. It plays a protective role. It is first in line to fight off any aggressions. The cortex : the body of the hair fibre, containing keratin fibres and coloured melanocytes that give the hair its colour. The core : its structure varies.